After 2 1/2 years, 23 countries, and countless good times had and memories made, it was almost time for me to head back to the States. I had promised to be home for Christmas, and, having missed the previous two, knew that if I didn’t make it home in time, I might not be allowed back. That being said, I still had a few days to left before my flight home from Cairo, and was definitely going to make the most out of them. Having just wrapped up 70 days spent on a truck traveling overland through Africa, followed by 5 days of non-stop pyramids and papyrus, tombs and temples, mummies and museums in Cairo and Luxor, I figured the perfect way to wrap up my 2 1/2 years of traveling was to spend a few days relaxing on the beach. I had always heard great things about the Red Sea- beautiful beaches, crystal clear water, and some of the very best SCUBA diving in the world- and decided that was the perfect place to wrap up The Expedition. I did some research, picked a destination, and booked an overnight bus from Luxor to the Sinai Peninsula, headed for the small seaside town of Dahab. 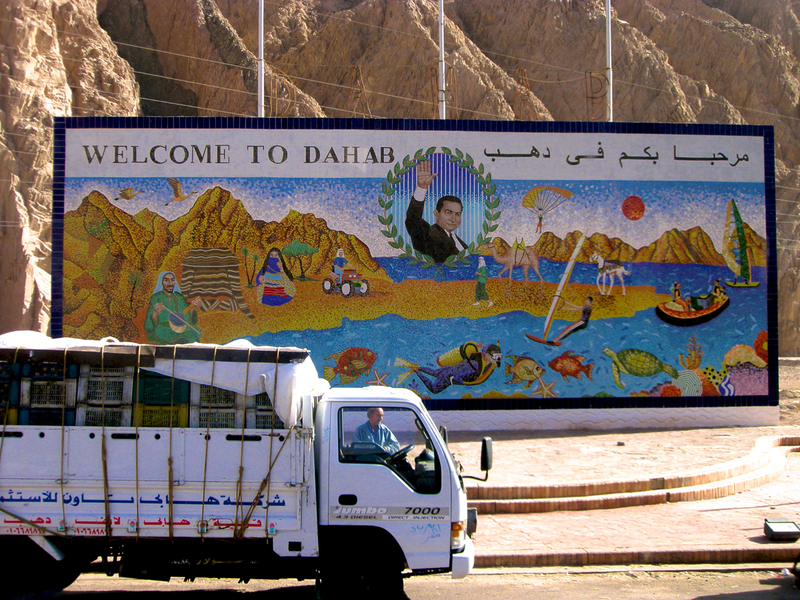 The town of Dahab is located on the southeast corner of the Sinai Peninsula, which itself lies in northeastern Egypt, separating Egypt from Israel. The peninsula is bordered by the Gulf of Suez to the West, the Gulf of Aqaba to the East, the Red Sea to the South, and the Mediterranean Sea to the North, and is actually geographically a part of Asia, as opposed to the rest of Egypt, which is part of Africa. Confusing, I know. 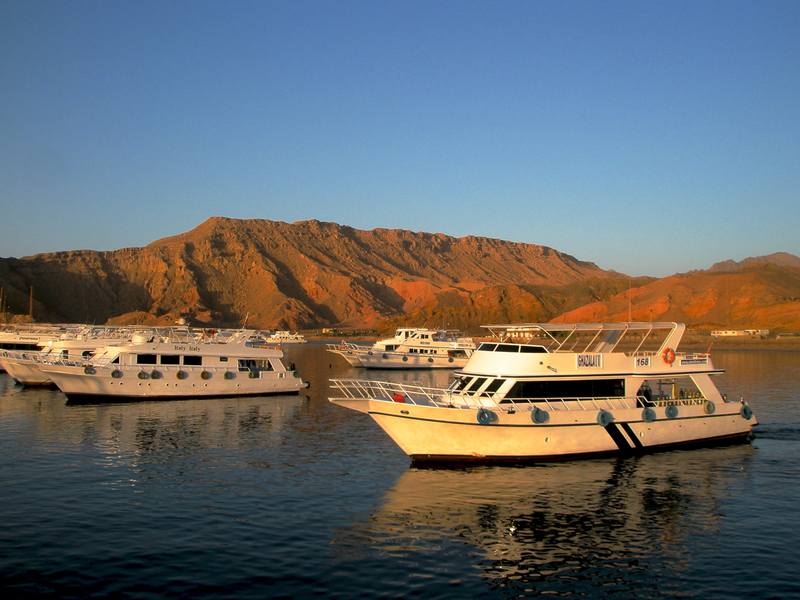 Dahab has long been a top destination for SCUBA divers, with the infamous ‘Blue Hole’ and ‘Canyon’ dive sites literally just off the beach, these being just two of the innumerable world-class sites found locally. The posh, up-scale town of Sharm el-Sheikh is just 80kms south, providing access to even more dive sites in the incredible Ras Mohammed National Marine Park. 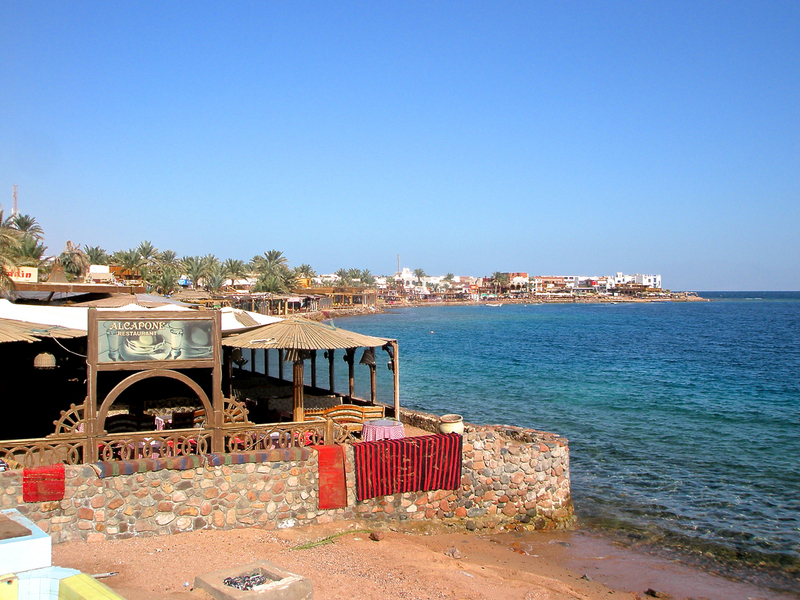 Dahab is also growing in notoriety among wind-surfing enthusiasts, and continues to be a booming town for backpackers. Despite all of this, Dahab still attempts to maintain some semblance of its humble origins- that of a quiet Bedouin fishing village. Leaving the mega-resorts to the glitzier Sharm-el Sheikh, it caters to the budget traveler- the backpacker- with beach-front hostels and budget dive operators. Divers are up early, grabbing a quick breakfast before heading off for the dive boats and the day’s adventures. 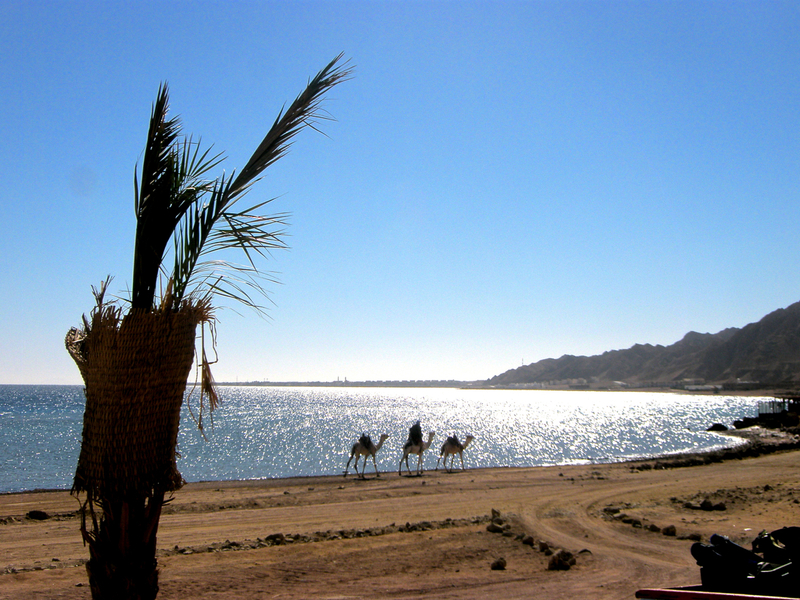 The rest of Dahab comes to life slowly, the lure of sunshine and the pangs of hunger eventually rousing the masses. Food is cheap in the bedouin-style restaurants and cafes that line the waterfront, and the boardwalk is full of young travelers, reveling in the Egyptian sun, chatting with the shopkeepers, haggling over the price of a shisha pipe or a t-shirt. Open-air stores full of locally made jewelry, delicate lamps, woven blankets and handbags mix among dive operators and coffee shops, each seeming to maintain the delicate balance between ‘bustling with activity’ and ‘laid-back and relaxed’. Hotels and hostels spill out across the boardwalk, each having its own ‘private beach’ right on the bay, complete with lounge chairs, umbrellas, and cocktail bars. 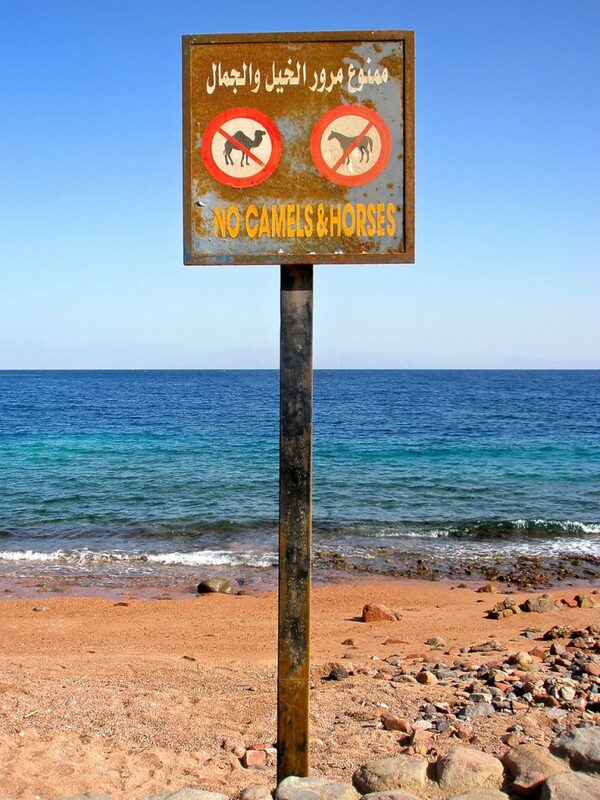 Tourists hire snorkel and scuba gear and then simply walk off the beach, the coral reefs right there to explore. 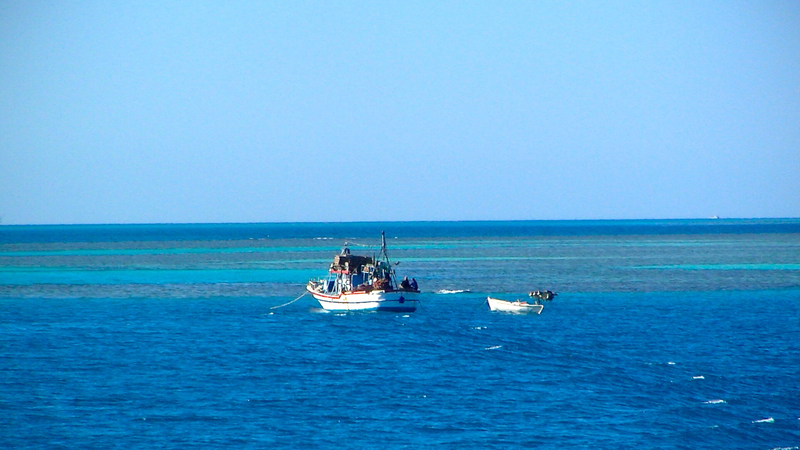 And so the afternoon goes, some active, some not so much, but all enjoying yet another beautiful day in Dahab. As the sun begins to dip, the restaurants come to life, colorful lanterns and small fire pits attracting the hungry travelers. Delicious dishes of rice and chicken are served at low tables, diners seated on benches covered with traditional cushions. The aroma of the food mixes with the smell of the sea; a cool breeze blows through the restaurant, causing the light from the lanterns to flicker; soothing Arabic music plays over the sound system- all combine to set a scene both wonderfully and uniquely Dahab. After the meal is finished, the shisha pipes come out, red and green and orange and gold. Tea is served as the pipe is prepared, the coals hissing and sizzling as they’re added to the hookah. After a few puffs to get it going, the pipe is passed around, everyone content to sit back and enjoy the Egyptian ambiance and the company of friends, both new and old. Needless to say, I LOVED Dahab- it was like being on an island in Thailand, with a uniquely Arab twist. The scene was cool, I met some great people, the diving was INCREDIBLE- really, what more could you ask for? It really was the PERFECT way to conclude my 3 months in Africa, and my 2 1/2 years abroad. I definitely hope to make it back someday.